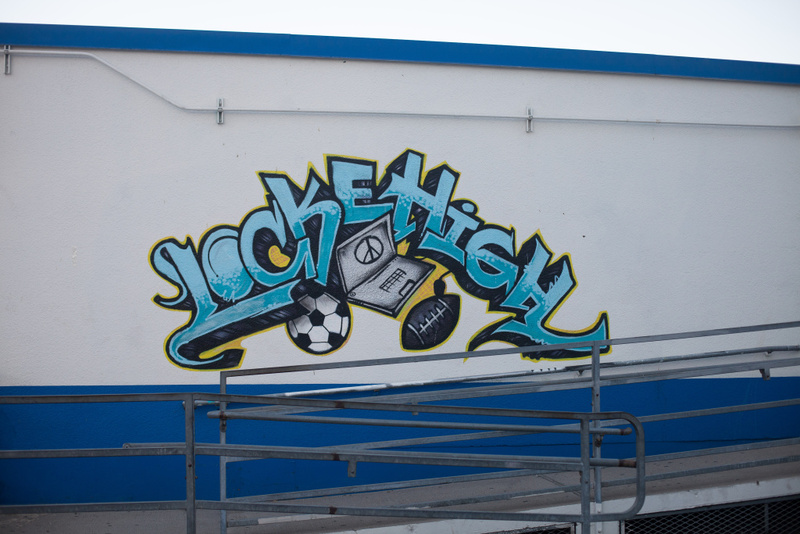 LA's notorious Locke High School is improving. Is it still 'failing'? 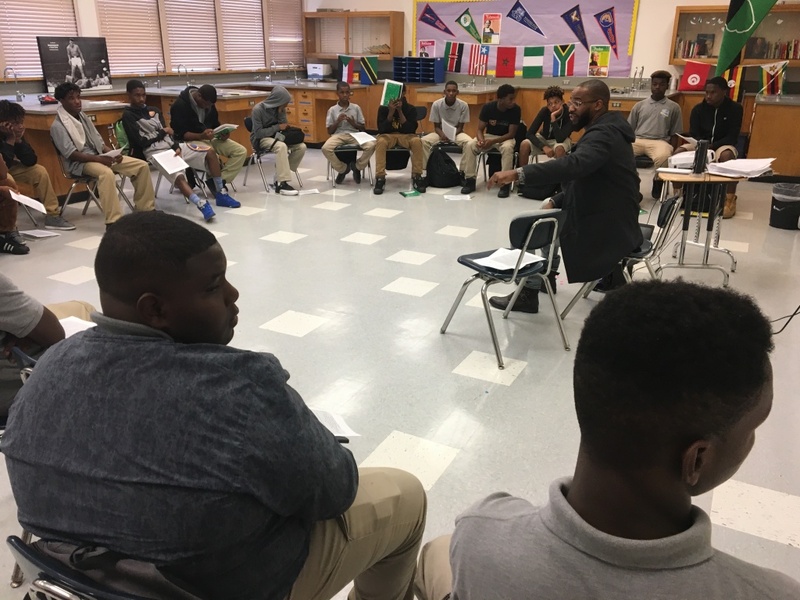 Locke High School math teacher Eric Strong leads the group of students in the "See A Man, Be A Man" program. 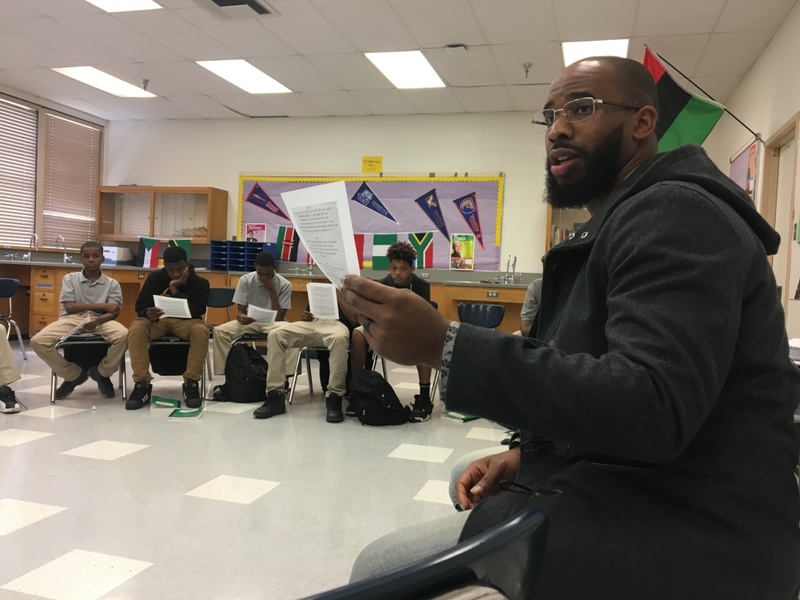 "SAMBAM," for short, is a program designed to connect young African-American students with role models and mentors. In 1967, two years shy of her high school graduation, LaVern Antoine moved to the new school opening up in her neighborhood: Alain LeRoy Locke High School. "It was, like, the most fun school ever," Antoine remembered. The opening of Locke was a source of excitement in Watts. At the time, the neighborhood was only two years removed from the riots that mark Los Angeles to this day. In Antoine's high school days, students were proud to say they attended Locke — and especially proud to say, as she can, that they marched in the Locke marching band. The "Marching Saints" were a sensation, traveling the country, high-stepping through performances on huge stages for screaming fans. "We wanted excellence, nothing less," remembered Antoine. "And our teachers didn't stand for anything less." Long after Antoine graduated, Locke fell on hard times. Students perform during the homecoming football game on Saturday October 21, 2017 at Locke High School in Los Angeles, CA. 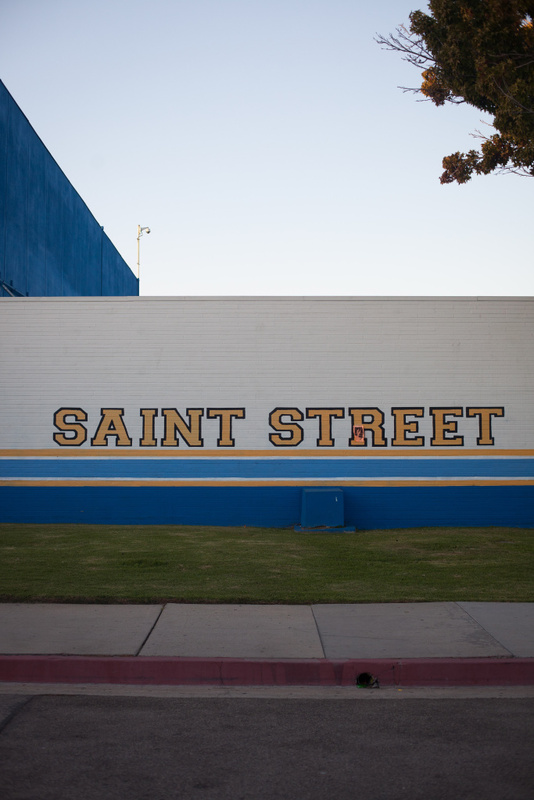 The school became notorious for drugs, graffiti, fights and dropouts. The Marching Saints declined, too, The band room became a storage space. Visiting Locke decades later as an alum, Antoine found something less tangible was missing. "It was very unfriendly," she said. 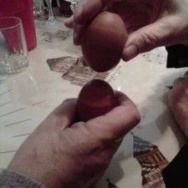 The students, Antoine recalled, "were in these little groups, heads down. I didn't see [anyone] walking with pride." 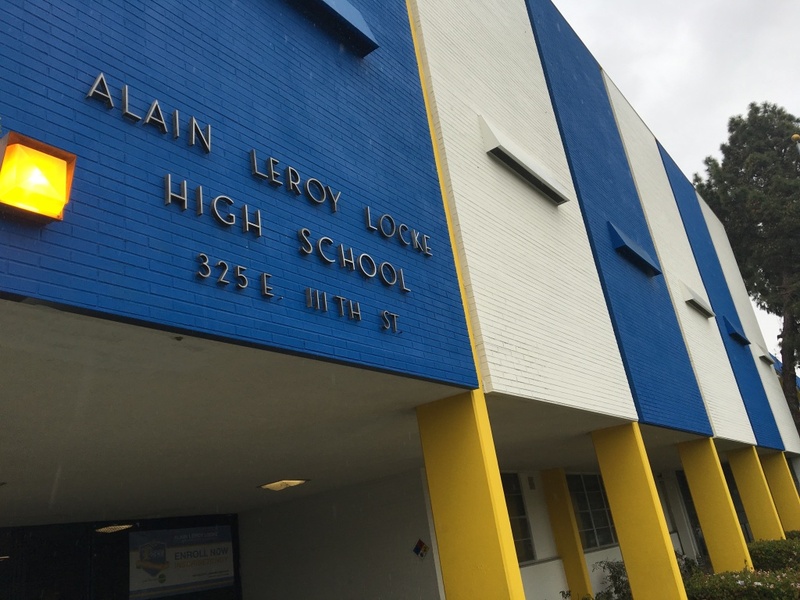 Ten years ago, school reformers launched an extraordinary effort to restore that pride in Alain LeRoy Locke High School — and reverse years of low graduation rates and low test scores. In 2007, a group of Locke teachers essentially staged a coup. 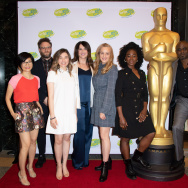 They voted to turn Locke into a charter school, kick out the L.A. Unified School District's leadership and turn the school over to a charter network called Green Dot Public Schools. Green Dot leaders promised a profound transformation for Locke. "We think the kids here have been academically abused," Steve Barr, who led Green Dot at the time it took over Locke, described his mission in a recent interview. "We have to undo that." A wall at Locke High School in Los Angeles, California on Saturday October 21, 2017. In the decade since, Locke has made strides. They've improved the school's physical appearance. The school's problems with violence and graffiti have subsided. The Locke takeover has been profiled in national news outlets and highlighted by the U.S. Department of Education. Green Dot leaders say Locke students are now making extraordinary growth in core academic subjects. To top it off, Green Dot recently revived and is beginning to rebuild Locke's once-famed marching band. Yet for all these improvements, Green Dot has also found out just how difficult it is to act on its initial promises. Locke High School's graduation rate — at 55.9 percent — is one of the lowest of any comprehensive high school in L.A. Unified, charter or otherwise. 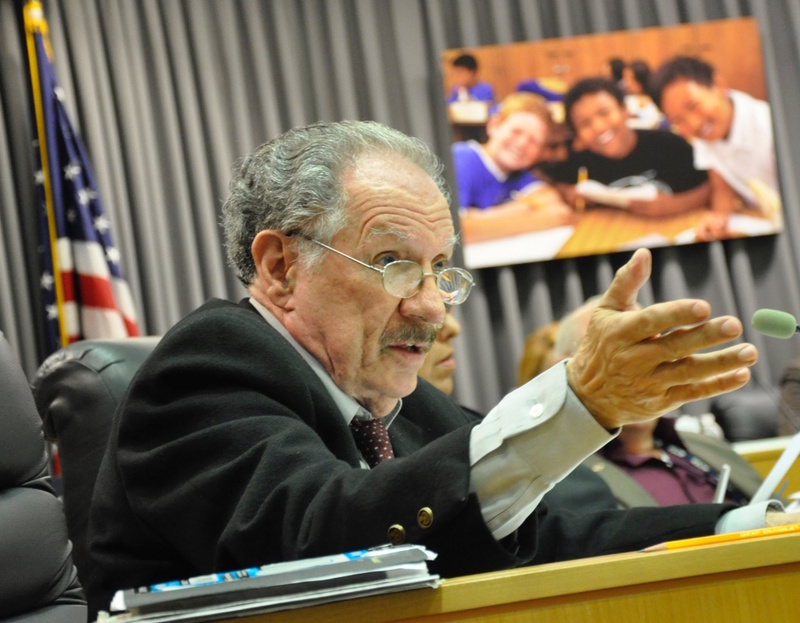 In October, L.A. Unified school board member George McKenna voted against allowing Green Dot's turnaround effort at Locke to continue. Locke was still failing too many kids, McKenna said. He felt Green Dot was skating by because its test scores are only slightly better than other nearby schools — schools that also serve mostly poor black and Latino students. The story of Locke High School raises a number of questions. How should we measure the success of plans to transform underperforming schools, especially when it's still rare to find schools that have completely reversed years of failure? How do we foster progress in these schools as students of color and of poverty continue to lag behind their more-privileged peers? At Locke, McKenna contended — with Green Dot's top leadership listening in the room — "The acknowledgement of their effort isn't helpful." "It's assuaging, I'm sure," he added, "to the people who say, 'Give us another five years.' But they've had 10 already." NOTE: Between 2007 and 2013, Locke was technically divided into several smaller schools, with several of these schools reporting separate graduation rates each year. 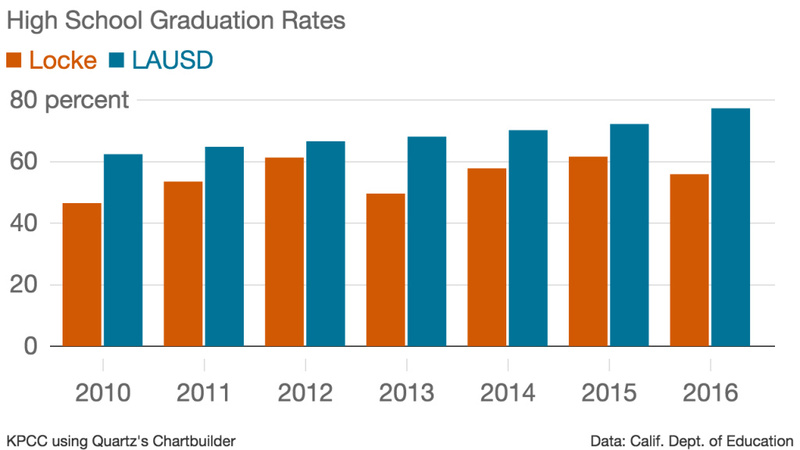 This chart aggregates the graduation rates for any of the six entities that were housed on the Locke campus between 2007 and 2013 that reported a graduation cohort in any given year. When Antoine was at Locke in the 1960s, the school's marching band was legendary. She played glockenspiel in the band. "I could tell you, I might not have been the student that I was if it wasn't for the music program," Antoine said. "I might've been subject to ditch school, do other things." In the years after her graduation, the band marched in high-profile parades including the Rose Parade and a parade as far away asHawaii. They recorded albums and won shelves full of awards. Search YouTube, and you'll find videos of a huge band playing to screaming fans. Those good times, though, didn't last forever. Hard times hit the school, and its surrounding community. "In the '80s and '90s and early 2000s, the band really got forgotten," current principal Jamaal Williams explained. By the time Green Dot's Steve Barr first set foot on Locke's campus in 2003, the marching band was far from the only thing that had fallen by the wayside. "I've been to most of the high schools in L.A., and there was nothing that would prepare you for what Locke was like," Barr remembered. "When I'd walk across that campus," Barr said, "I could sense that at any time I could just get hit — and I'm a big guy and have been doing this work for a while. In the middle of class, you'd walk around the campus, everyone would seem to be out of class. You could smell weed. You could see kids gambling." Barr founded the first Green Dot school in 2000 and, by the mid-2000s, was looking for an L.A. Unified School District campus his network could take over and turn around. Locke was a candidate. 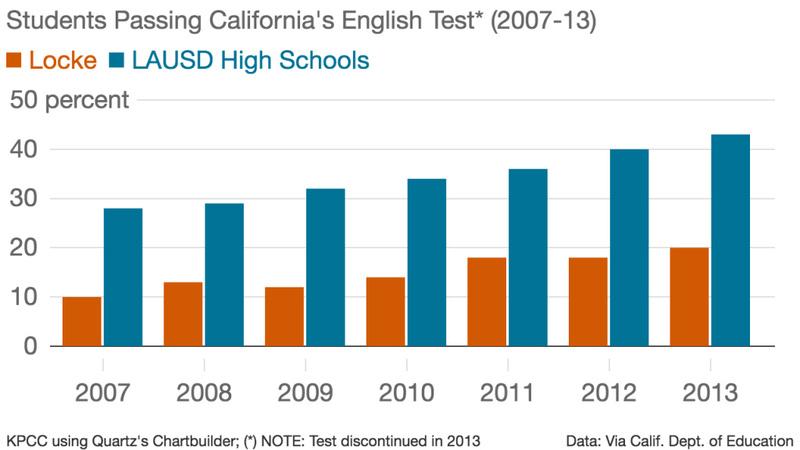 In 2007, only one in ten Locke students earned what was considered a passing score on California's English tests. More than two-thirds of students scored in the worst two levels: "below basic" or "far below basic." That year, the district's then-superintendent, David Brewer, first contacted Barr about handing Locke High School over to Green Dot — but backed away from the offer. Barr met with approximately 60 Locke teachers on his own. What he said he heard was a sense of profound neglect. "After five hours," Barr remembered, "one of the teachers got up and said, ‘Look, face it. The only time the district comes to our school is when a kid gets shot.’ And that was the first time they agreed on everything. And then another teacher said, ‘The only time our union comes out here is when Green Dot is mentioned.’ And I just remember thinking… 'Oh my god, we just got this school. I think they’re ready to do something big.'" Eventually, under the provisions of California's charter school conversion law, a slim majority of the school's tenured teachers voted to take Locke charter. As a charter school, Locke could keep its public funding. But since charter schools operate outside of the school district's direct control, Green Dot would have more freedom from some of the normal L.A. Unified rules. 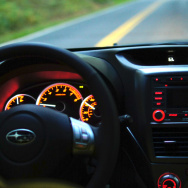 With that freedom, Green Dot promised it would make dramatic changes. Ten years later, many kids and adults report that they think Locke looks and feels different than it did before the takeover. Rubi Ceja is a freshman at the school this year but she remember the poor reputation Locke had in her neighborhood. "People would tell me that it was not a good school," she said, "because I guess before, it was bad and all that. But I feel like it's not. It's actually a great school… I think they have improved." On Oct. 3, Cristina de Jesus, president and CEO of Green Dot Public Schools California, addressed the L.A. Unified School Board. De Jesus came cap in hand. 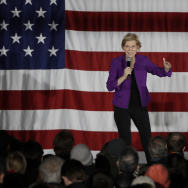 She said Green Dot had arrived in 2008 full of hope — and "full of ego." "We thought we could take our experience of starting successful independent schools and apply them directly to the Locke context," de Jesus told the board. "We were on a mission to save Locke. I stand here today, ten years later, to share with you that in reality, Locke saved Green Dot." Because Locke is a charter school, Green Dot needed to get the board's permission for Locke to remain open for another five years. All charter schools have to periodically petition the board for a "renewal" — an exercise that is not perfunctory. The board can, and sometimes does, reject charter schools' renewal petitions. Locke may look and feel different to many of its students and staff but on paper, the school is still struggling. In 2017, L.A. Unified's results on state tests were essentially unchanged from the year before. A little more than half of the district's 11th graders met or exceeded the state's standards on English tests; just under one in four met or exceeded the math standards. But at Locke, those marks decreased in 2017 — to 39 percent in English and just 8 percent in math. In her speech, de Jesus acknowledged the work at Locke has been humbling for Green Dot. Still, Green Dot's renewal petition points out that while Locke’s test scores aren’t stellar, they are as good as, if not slightly better than, other some high schools that also serve mostly poor black and Latino kids. Most board members were sympathetic. "They have not yet overcome every challenge," said board member Nick Melvoin, who once taught at nearby Markham Middle School but, he added, "I don't see other charter partners taking on efforts that Green Dot is." “We don’t want to penalize schools that are serving high-needs communities, so I try to take the data in context," board member Kelly Gonez said. The praise didn’t sit well with fellow board member George McKenna, an educator in L.A., Inglewood, Compton and Pasadena for more than 50 years and the only African-American member of the school board. He took particular exception to the idea that Locke should be given a pass because it posts better test scores than other nearby schools, where test scores also lag behind district averages. McKenna argued that measuring Locke against schools like this is tantamount to saying, We don't believe kids of color can learn. “When you talk about ‘taking into context,’ and it’s like, well, 'We can make excuses for these people because they’re not expected to go any higher,'" he said at the meeting. "To 'take it into context' means their success is relative." 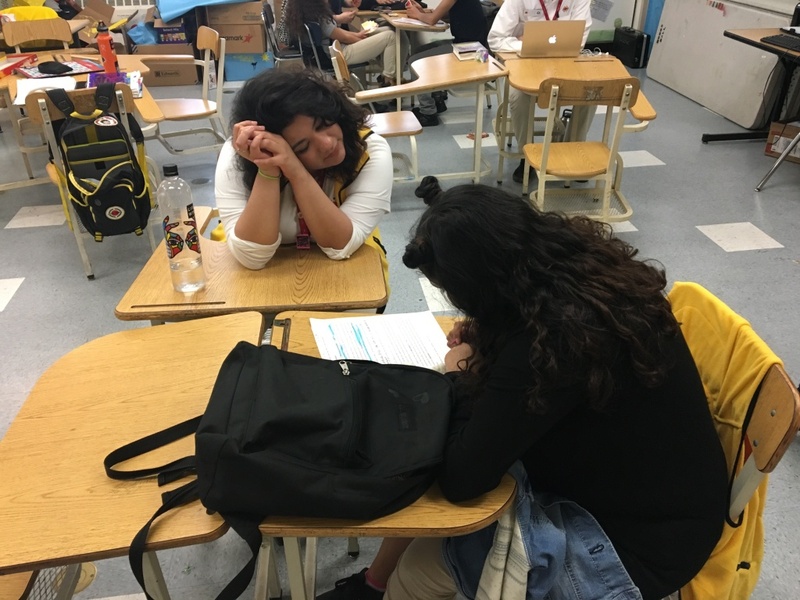 A volunteer with City Year assists a Locke High School student with her work on March 21, 2017. McKenna was the only board member to vote against Green Dot's renewal petition for Locke. Green Dot leaders argued they are making measurable progress. Dig deeper into the numbers, they say: For every year a student spends at Locke, she makes a year-and-a-half's worth of growth in math. Locke students make around two years' worth of growth each year in reading. That kind of progress gets hidden when students arrive at Locke — as Green Dot leaders say they do regularly — reading at a fourth-grade level, begging the question of what's happening at the elementary and middle schools that feed into Locke. “To hold Locke solely accountable for catching kids up is actually the wrong path to go down," said de Jesus in a follow-up interview with KPCC. "We need to look at the K-12 continuum to figure out how we can all come together to better serve kids." Los Angeles Unified school board member George McKenna speaks during a board meeting on Aug. 22, 2017. McKenna agrees that L.A. Unified officials must improve Locke's feeder schools and demand better performance out of all the school's for which it's directly responsible. While he doesn't deny Locke’s doing better than some other high schools in South L.A., he said that doesn’t mean Locke is succeeding. “Don't tell me all you have to do is do better than the underperforming public school next door. And you say, ‘They’re no better than we are, we're no better than they are. Leave us alone,'" McKenna told KPCC. "Neither one of you should be left alone,” he added. "All of us should be held accountable." It's fair to ask what McKenna means by "being left alone." Charter school advocates might argue Locke is not being left alone. As a charter, Locke's leaders have to go out in public every five years and justify their existence to the school board. Charter school advocates frequently charge that not all L.A. Unified schools could stand up to this level of scrutiny. "I have a lot of respect for George McKenna," said Green Dot founder Steve Barr, who left the charter chain in 2009. But Barr took issue with McKenna's questioning whether Green Dot was the right operator for Locke moving forward. Barr doesn't see a better alternative. "It’s a question I respect," Barr said. "I don’t think it’s fair. I haven’t seen anything in the last ten years that would say, ‘Boy, this district has really figured it out.' LAUSD is not ready for the job yet in that neighborhood." McKenna's argument is also a turning of the tables, echoing the same sort of rhetoric used by school reformers to justify takeover efforts of district schools all over the U.S.
Over the past decade or more, state and federal lawmakers passed a wide array of laws, including the No Child Left Behind Act, which empowered school reformers to intervene in chronically underperforming schools by taking them over, replacing the staff or shutting them down. 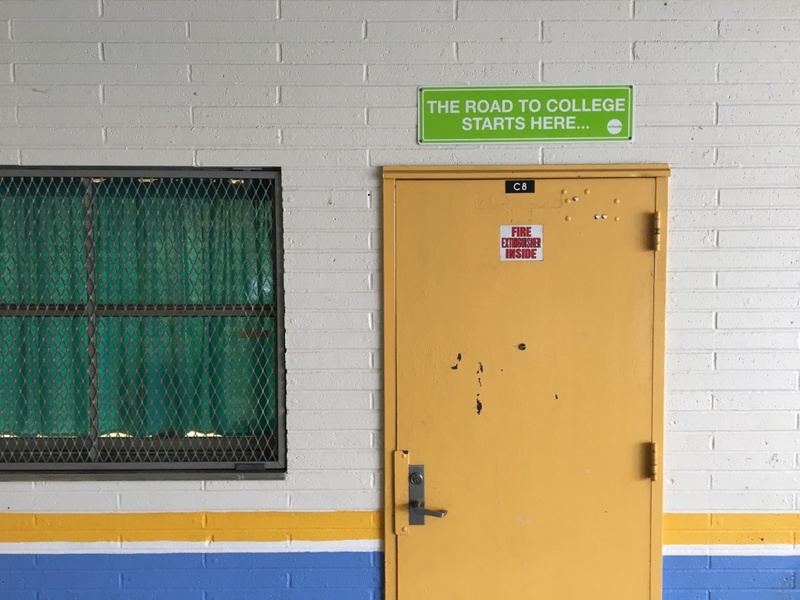 A sign reading "The road to college starts here" with the logo of the Green Dot Public Schools charter network hangs over a doorway at Locke High School in South L.A. It's not clear whether that effort resulted in school improvements at a broad scale. The consensus, however, remains that in a decade of efforts targeted at the nation's proverbial Locke High Schools, very few schools have completely reversed years of failure. "And I do think high schools are seen nationwide as the hardest nut to crack," said Susan Lusi, who runs Mass Insight Education, a non-profit group that does school turnaround work nationally. Lusi is not intimately familiar with Locke, but has heard of the turnaround efforts there — and recognizes Green Dot's struggles. "I have heard other people coming from charter backgrounds who have had the same humbling experience." Lusi said it's necessary to find a balance between Green Dot's argument — that we ought to celebrate students' growth and the school's progress — and McKenna's argument that progress means little if students don't earn diplomas or pass tests. 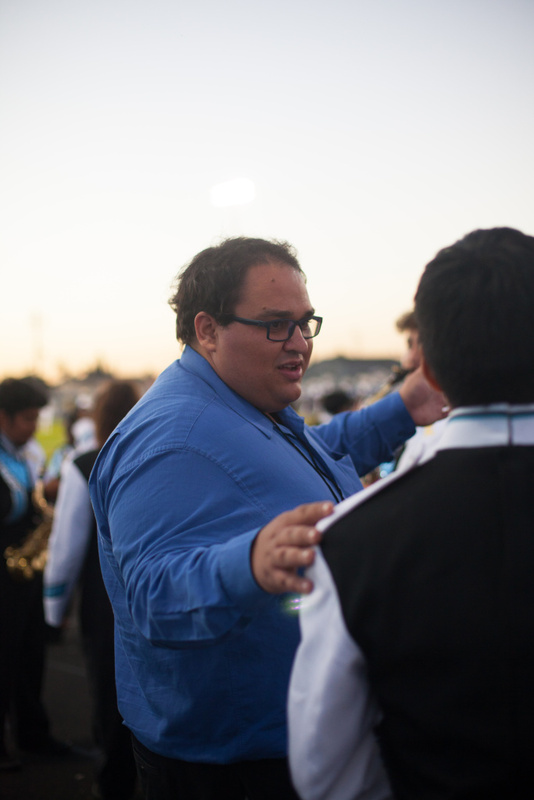 Matthew Stickman, co-director of Locke High School's band, speaks to a student at the homecoming game in October 2017. While much of Green Dot's turnaround has focused on academics, the band is one form of progress at Locke. Rebuilding the band hasn't been without its challenges. Some students arrive with little musical education and have to start from scratch. Funding is tight, so some students have to share instruments, and they had to buy used uniforms from another school. Still, there are two co-directors and about 80 members in the band this year. They marched for the alumni at homecoming. 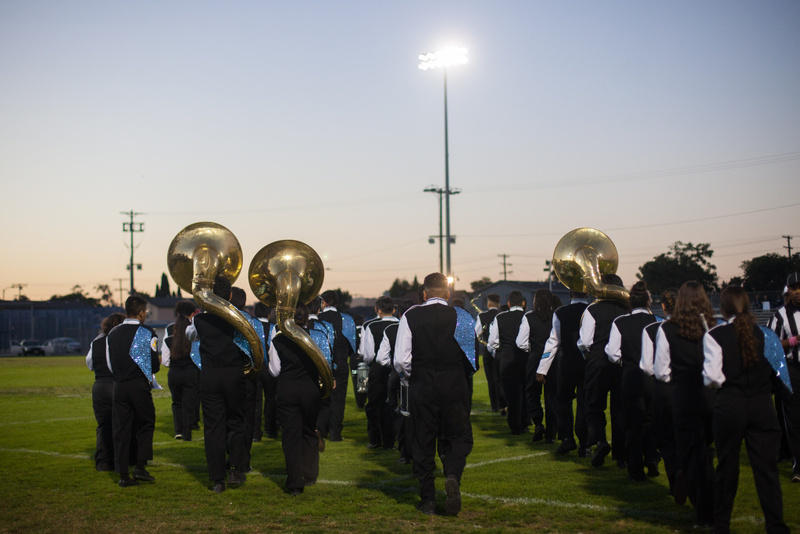 "We're trying to come back and trying to instill this sense of belonging in a community where a lot of the kids don't feel like they belong anywhere," explained Matt Stickman, one of the new co-directors of the band. He believes the band can give kids a reason to come to school, just like it did for LaVern Antoine back in the 1960s. 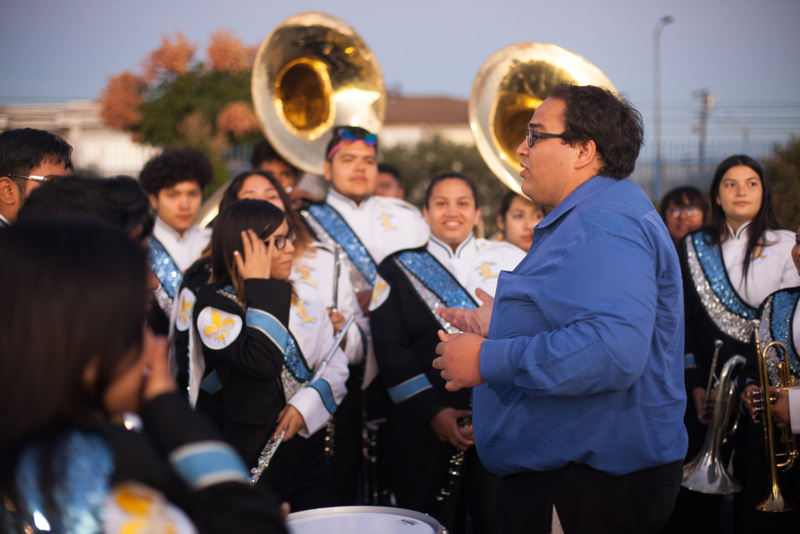 Band co-director Matthew Stickman speaks to band members at the Locke High School homecoming game. That has proven true for Locke sophomore Juan Olivos. He said when he first got to Locke, the band wasn't very prominent and it felt like something was missing. Now, he plays trumpet in the band. "When I walk into a class, I walk in stressed," Olivos said. "But when I walk into band, I walk in all calm and happy." He goes to the band room, and to the people inside of it, when times get tough, like when he lost a family member. Olivos wants to go to college to study music and he believes being in the band – along with Mr. Stickman’s help – can help get him there. 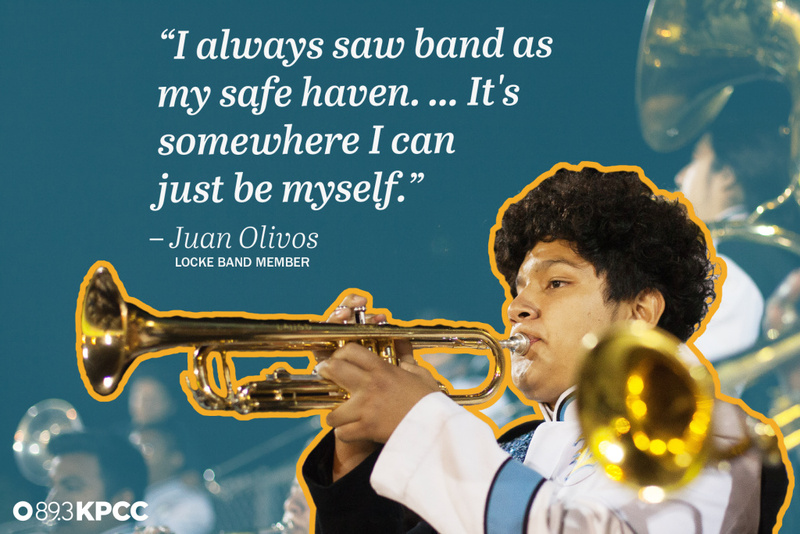 For now, he says he’s excited to be part of the rebirth of the school's legendary band. "We're working hard to make the school as great as it was back then," he said. His fellow trumpet player, senior Adani Rivas, agrees. "We're the band for this school," Rivas said. "We're showing people that we could go down and rise up again, no matter what." A wall at Locke High School in Los Angeles, California on Saturday, October 21, 2017. As for the future of the school, the LAUSD board gave Green Dot another five years at Locke but they also promised to keep closer tabs on the school to ensure the turnaround doesn't flame out. That means five more years to try to help Locke succeed — and five more years to bring back the school's marching band.